Innovation is the most divisive concept in gaming. Most gamers want change or at least say they’re tired of the same thing, yet complain the second things don’t fit that mold. Even if this offers low lows, it can also lead to untold highs. 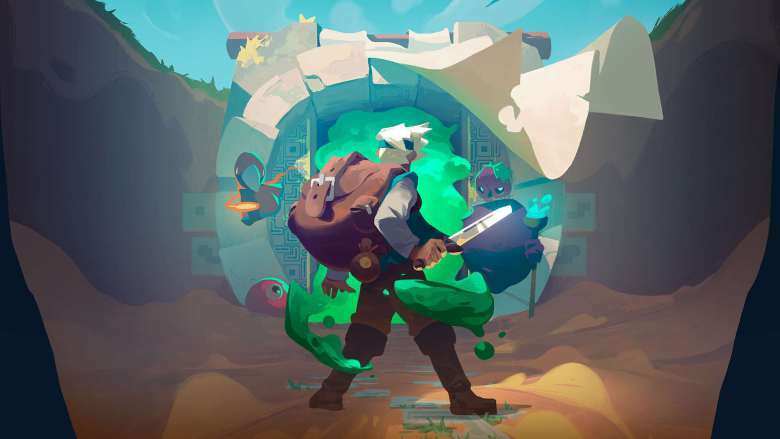 Moonlighter is the most recent example, offering an action adventure game with rogue-like elements that focuses on the lowly shopkeeper. With a unique take, a fair amount to do, a world to explore and a town to rebuild, does it manage to give the right mix or would it have been a better game by painting by numbers. 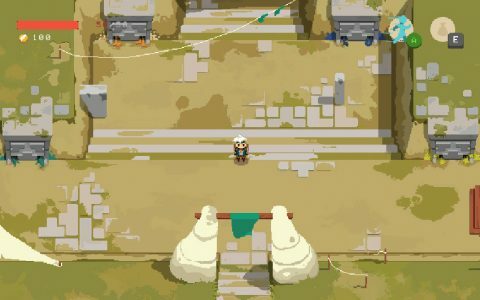 There isn’t much of a story to Moonlighter. You play a shopkeeper who runs the Moonlighter and dreams of opening the final mysterious dungeon. He is also tasked with maintaining his shop and ultimately bringing the town to its former glory, giving him plenty to do, even if it seems simple by game terms. This causes the experience to have a very simple, predictable and arguably boring arc. 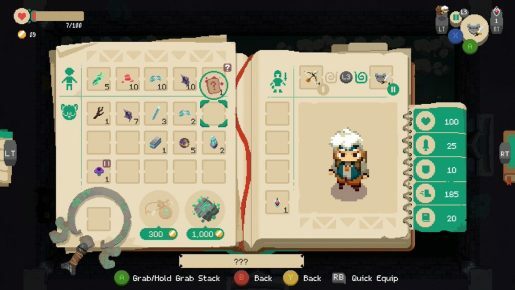 Every time players enter a dungeon the idea is to progress, collect items, sell less non-essential ones in the shop, purchase upgrades to the town or equipment and then complete the dungeon, only to do it again. The issue with this system is, regardless of how much fun exploring and combat is, most of your time will be spent doing less interesting things. For instance, on average, I probably spent more time doing inventory management than actually fighting monsters in a dungeon. Items you can’t take are best destroyed for some profit, with chest, rarer and more important items typically having conditions to obtaining them. These include warping/destroying/removing the curse of/swapping places with an item next to it, breaking if you take enough hits, requiring a specific spot in the bag and so forth. If this isn’t enough to think about, you’re limited to 20 items, unless you get lucky and find a warping chest, and you’ll need to constantly pick up and destroy useful and useless items to maximize efficiency. To further this, prices are rather high, especially in relation to what you can sell, making it far too costly and time consuming to bother with a lot of the mechanics. A full set of armor goes from costing a couple thousand, to 132,000 or so, which skyrockets from then on. This puts a high emphasis on the shop keeping aspect. 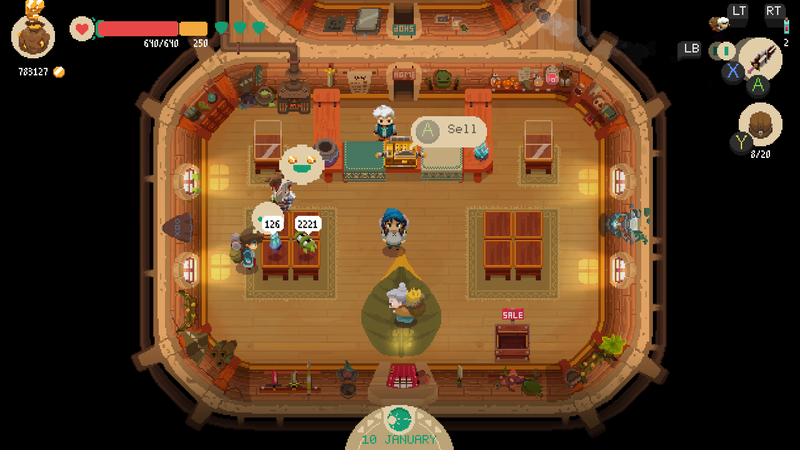 Items can be sold for more than destroying them yields, so the best way to build capital is to sell high value items in the shop. To do so, players need to determine the value, open the shop, wait for a customer to decide to buy it and basically wait. Pricing is a huge element of the Moonlighter, one that determines how successful your shop is. The idea behind the system is simple and exceedingly boring. Get an item, price it somewhere, look at how customers react and edit accordingly. Odds are you’ll overestimate most items and underestimate the few that are actually worth something, making most of the experience looking at people sighing, editing the price and hoping it is low enough to yield a profit. 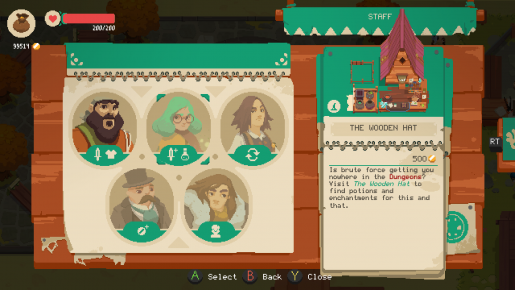 While doing this, players also need to stop thieves from taking items and figure out the overall market interest. Items will fluctuate between high and low demand, something that will potentially lead to more profit. When done correctly or at least well, players will have the money needed to purchase whatever they need and give you the ability to either progress to the next dungeon or extract more items at reduced risk. However, the overall value and difficulty of things is poorly designed. The only thing players need are the most powerful current weapon and fully upgraded starting armor. A good offense will mitigate damage far better than being able to take another hit or three, making that the best way to progress. From there, upgrading weapons is far too costly for what they do, outside of the base ones. Like, fully upgrading the second weapon gives enough attack to almost rival the base form of the next tier, at a cost that rivals making a full set of the next tier armor and then gets reset at the higher tier, making it impractical to bother with outside of the highest level. 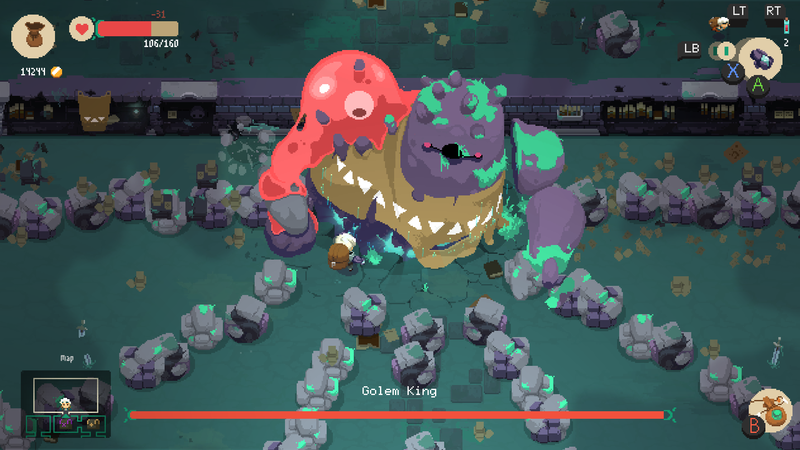 Similar things can be said about a variety of things in Moonlighter. Decent skill is enough to render potions irrelevant and the ones that help you navigate dungeons are impractical outside of a couple extremely specific situations, none of which justify the existence of the system. Likewise, the vender that sells any item charges so much that it is often impractical to buy over heading to the dungeon and finding it. And, to make matters worse, I ran into a multitude of annoying and tedious glitches and/or problems. From the start, I quickly learned overfilling the unlabeled quest chest, at least at the start of the game, will cause the game to crash on the PlayStation 4. This took me a while to realize and something I haven’t messed with since learning. Certain fights, such as the second boss, have annoying glitches like certain destroyable obstacles that the boss takes out simply turn invisible, with it being possible to take damage without actually taking damage, which is in some way working incorrectly and cost me a no damage run (I didn’t take damage but it says I did, so I lost it). Another happened with the banker, who I gave a massive sum of money to and seemingly lost either because I didn’t collect it at the end of the week or it just glitched, either of which is infuriating if you’re not keeping track or are aware of these things. For as much as I complained about Moonlighter, it’s actually a lot of fun, it just has a lot of bad parts between the fun bits. If the bugs get hammered out, upgrading becomes practical and the progression arc is reduced in the future or at least on the Switch version I can see it being a hit, but the current form needs a lot of work. Glitches and errors aside, the idea of constantly having to collect and sell loot to purchase marginally better gear is daunting, leaving an experience that is pretty bland. Combine this with the fact the experience is more static than varied and you have an interesting adventure that does almost everything in its power to squander what good it has. Hopefully it will improve in the future and those willing to take the chance on it won’t have a terrible time, it just has a lot of room to improve.